Should We Put The Brakes on AI? I wonder how loudly they would have cheered if the hoodwinked human was a man, and the AI was impersonating a corporate recruiter doing an initial phone screening. How would you feel about being interviewed by a machine for your dream job, especially if you didn’t find out about the ruse until the ordeal was over? A hair appointment, a job interview, a remote psychotherapy session… at what point do we say, “That’s going too far” with AI? Do we draw the line before or after we arm AI with deadly weapons and set it loose in a war zone? How about Robocop, an AI that walks among civilians meting out “justice” with sometimes deadly force? The job of a judge is not really judgment but to apply the law and precedent to a given set of facts. Why can’t an AI sit in judgment on a human being? For that matter, why does a jury need to consist of human beings? Artificial intelligence is being used for self-driving cars, stock trading, manufacturing, healthcare, and many other areas. Should we let AI take over all of the jobs it can or should we reserve some occupations for humans only, just because humans need something useful to do? Where are teenagers supposed to learn discipline, responsibility, and “people skills” if all of the entry-level burger-slinging and cashier jobs are taken by AI? Can a human infant be raised entirely by machines? That was the origin of “Magnus, Robot Fighter 4000 A. D.,” a comic book hero born in the 1960s and resurrected in the 1990s and again in 2010. Already, AI companion bots for the elderly are being tried in Japan. It would be natural to let robots care for infants, too. Of course, they would have to be the very finest robots, full of love and compassion; but an AI could fake those convincingly, perhaps even more so than a tired, frustrated human mother. Will AI Have Unexpected Benefits? Some speculate that AI will open up new employment opportunities for humans who are displaced by software. This happened with the advent of the automobile. Jobs related to horse-drawn carriages were lost, but new ones in design, manufacturing and repair were created. I'm not so sure that the same thing will happen with AI, because the goal there is ever-increasing optimization of processes. Max Versace, writing in Forbes Magazine, makes the argument that AI and robotics will eliminate only those jobs that are the most unpleasant or dangerous, such as the assembly-line worker, the coal miner and the taxi driver. Robots, he says, will enable a factory worker to become much more productive, perhaps even leading to a four-hour workday and more leisure time. The present forebodes the future. Right now, we are being lulled into complacent acceptance of AI in whatever capacities its creators want to put it, from “personal assistant” to nuclear weapons launcher. Yeah, Mr. Pichai and his fellow AI salesmen know how to choose their scenarios. Even Elon Musk, whose futuristic endeavors have benefitted from AI technology, says we should be cautious (even afraid) if AI is allowed to develop with no guidelines or oversight. Vanity Fair's article Elon Musk’s Billion-Dollar Crusade To Stop The A.I. Apocalypse is an eye-opening read. We, the People, need to shrug off the glamour of AI and seriously ponder how far we are willing to let them go, while we are still in a position to control them. 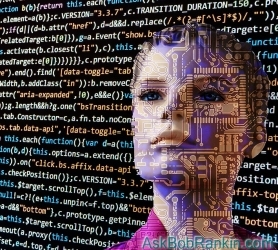 Most recent comments on "Has Artificial Intelligence Gone Too Far?" I've had two robot calling machines that refuse to talk to my old and conservative answering machine; yes.... the derangement syndrome has reach AI. Mark me on the fringe of extreme. I'm the guy that would take a sledge hammer to a Coke machine for ripping me off for a quarter. I don't abide thieves, even mechanical ones. Do me the ultimate discourtesy of having a machine call me? Insure that I don't know who and where you are. If I find out my best advice is to hide. There's already a very successful tech entrepreneur, Andrew Yang, who is now running as a Democrat for President of the US based on AI taking things to the point where we will need a universal basic income because of all the jobs lost to it. So, yes, there are significant forces out there ringing alarm bells about AI. Didn't some South Korean company get in trouble recently for wanting to make military robots? And if you want "pleasant dreams", try reading "When the Machine Stops". Isn't it obvious to anyone that we already suffer from unintended consequences and have done for centuries. No need for AI. Will we suffer more or less with the help of AI? Will the military use AI to help them analyze war scenarios? Probably. Will they give the AI control over super weapons? Maybe. Some of the last century's sci-fi novels about runaway AI's have been mentioned. They also made a movie called Wargames in which the computer took over the nuclear missile control system and staged a fake attack so that the generals and politicians all thought Russia really was attacking. It's on secret that Russia has long thought they could survive a nuclear exchange with the US. But recovery would be hard with several years of nuclear winter, food running out, water contaminated, diseases rampant, etc. But what about the Terminator movies? Skynet decided that man had to go. Machines were better. So they nuked the planet. Radiation doesn't bother shielded machines too much. And they just build more. Sounds bad, but those are just sci-fi stories, right? But, as sci-fi writers like to say... what if? We need serious controls and oversight. Politicians have proved that they can't properly handle oversight. So who will watch and restrain the developers and implementers? Someone needs to give this serious thought. Can developers restrain themselves? That may be best. Get them to agree to lines not-to-cross and stick to them. And when some politician asks us to develop an AI President (thinking that the politicians can control 'him' or 'her' or 'it')... just say no. It has gone too far already. We are losing our humanity. Our children, in large part, have become slaves already to technology, and it is only going to get worse. There is nothing like human to human contact in the real world. An image on a screen can never take the place of a living, breathing person. When life on earth stops being about money...life on earth will get better for everyone and we won't have to get rid of money to do this, just manage it better: including how much of it there can be and what it can buy, etc, and how much of anything anyone or anything on earth can "own," exclusively as their own private property or possession! Then, finally, we might have a chance for a happy future for all (not just those who can afford it). Posted by: Chris, 11 Aug 2018: "Isn't it obvious to anyone that we already suffer from unintended consequences and have done for centuries. No need for AI. Will we suffer more or less with the help of AI?" My answer: We will suffer less (if we do it right). Life on earth (responding to Grand Pa Ken) will never stop being about money, or power or leisure. Human nature being what it is, things created (nuclear weapons as an example) will be refined and used regardless of the foreseeable harm. Thankfully, most predictions of doom and disaster do not turn out to be so bad. What an interesting world my grandchildren will inherit! I **hate** it when a machine answers and say "I will help you" or "I see you are calling from ... ." A machine is not "I" or "Me" (help me understand you by repeating your request). Everyone should either refuse to "chat" with a machine or should emphasize that the system is not consumer friendly and not appreciated. Sadly, customer support is so bad today, some companies will hang up on you if you do not "speak" to their ego machine on cue. Everyone should make it clear this is not "progress." I feel AI should be used as a tool not a way of life. AI is great tool to help the handicapped or as a teaching aid but we seem to be getting away from human contact and human interaction. I think we will have certain corporate types pushing for more and stronger AI until the first AI CEO. Then when it seems they may also be replaced, it will be outlawed. Dave? Dave? Are you listening to me? For anyone tired of opining worst case scenarios, have a look at an excellent TED talk by an expert on AI with an optimistic view. Take a break from all the negativity already. I'm so torn. On the one side, I think, we'll adapt to it. We always adapt to it. On the other end, I think maybe machines CAN do too much for us and what abilities will be lost along the way? Can anyone rememmber more than 2 or 3 phone numbers in their heads nowadays? I think a lot of my negativity about it comes from that guy...yiou know the one...the guy who programmed his answering machine with "Hello?" and then 30 seconds into your talking to him chimes back in with "Just kidding, I'm not home. Leave a message...BEEP!" Who didn't hate THAT guy? Plus, I hated robotic answering machines ("press 1 for...") even BEFORE I learned that they were purposely being programmed to be annoying and frustrating so a percentage of people would just give up. What more devious psychological influences will AI be programmed for? I'm torn but leaning "against". and request permission to be able to continue. Yes, we the humans are being lulled into a false sense of security as we become more and more brainwashed by folks with alterior motives. Since science fiction from yesteryear has become today's reality, each new iteration sets the bar higher and higher. The animal species of homosapien will not last too much longer on this planet, as we self destruct in the name of an easy life full of leisure time and an appliance to do every task for us. That will include pressing the nuclear bomb button or the selective anilation button. I'm just glad I'm old enough that I won't be around to witness it. If you want to see one man's very plausible thoughts about the future and how we got here based upon the past read Sapiens and Home Deus. They are very well researched. Just make sure you start out with an open mind or you are bound to be offended somewhere along the way especially if religion is important to you. The books are not anti religion but they set religions in context of our past and future.